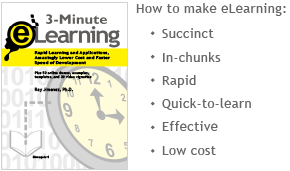 Home » Effective Rapid eLearning from Classroom Learning Content? Effective Rapid eLearning from Classroom Learning Content? Our belief: At Vignettes Learning we use stories in eLearning; however, we make them interactive. 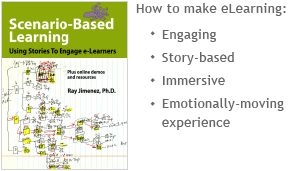 The emphasis is getting learners involved in the story and not just telling the learners the story. Synthesis. Subject Matter Experts (SMEs) are the royalty of their specific fields. Therefore, it is only logical to assign them the development of content in line with their expertise. Yet, developers must be constantly aware that content developed by SMEs for onsite classroom may not be as useful if used for rapid elearning. This is a reminder even for the best trainers who are inclined to take a short cut by using content not designed for rapid elearning. In my blog, The Master SME: How to become one? 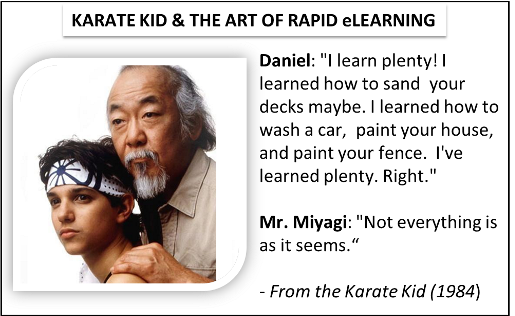 How to work with it?, I used the movie Karate Kid (1984) as a metaphor for eLearning development. Miyagi taught the bullied kid Daniel to defend himself by emphasizing the few key moves the teen can master in a few weeks against his well trained opponents, the Cobras. Miyagi did not teach him all the techniques. He focused Daniel’s energies and training on the basics that delivered the right blow at the right time. In a nutshell, this is what rapid eLearning is about and how SMEs should approach eLearning development. We only need to identify one small idea from the content and interweave it with an event based on the experience. After this, embedding the idea to be learned follows. This is achieved by creating an opportunity to play out the event. By spinning the learning, the trainer is able to solicit more information and feedback from the elearners. This interaction makes the eLearning “rapid”. SMEs know which buttons to push to maximize the learning with less effort. These are the main reasons why I caution developers who think that content developed for face-to-face classrooms could be used for rapid eLearning by simply making the content online. The process of developing content for rapid eLearning is different compared to the approach done by program developers for onsite classrooms. This recurring problem among e-developers should be constantly in check. “Although I recognize the merit of rapid eLearning tools, I must however disagree with the idea of developing eLearning without the intervention of learning professionals. Sure, having SMEs put together their own content, rather than having them feed it to an instructional designer who then assembles the content into a storyboard and passes it to a multimedia developer, can save time but how do you make sure what is produced by these SMEs has any pedagogical value? I reiterate that it takes more than converting content into online electronic formats in order to develop rapid eLearning modules. 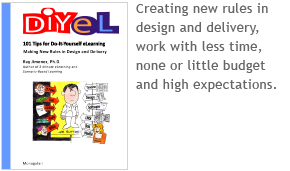 Rapid learning development has its own set of rules, approaches and strategies to be followed in order to be effective. In rapid eLearning, the learners learn in a completely different environment. They learn their ‘karate’ by painting the fence because in eLearning, “not everything is at it seems”.